We are the National Service Partner for ABB who have installed more Solar PV Inverters Globally than any other manufacturer. We service & maintain both Commercial and Residential solar panels systems ranging from large solar farms to small domestic solar installations both ground and roof mounted, we currently service around 3500 domestic customers all over Scotland, our most recent commercial system service was a 1 Megawatt system we serviced for ALDI at their Scottish distribution centre in Bathgate. The main benefit of having the Solar PV system serviced annually lies in getting the maximum return on your investment, we have lost count of the number of customers who have had us out to check the PV system only to find that either 1 half of the system has been working for 5 years or that the system has been running at a very low efficiency due to a fault, we can assist in any type of repair and are happy to diagnose and rectify whatever may be hampering the PV systems performance. Solar panels function by converting the sun’s energy into electricity. The more sunlight that reaches your solar PV cells the more power your panels generate. The angle of solar panel installations means they are prone to bird droppings and a build-up of dust & general dirt which won’t wash away during normal rainfall. This can cause a reduction in the amount of sunlight and affect the output efficiency of your panels. Projected earnings of any solar panel installation are measured at optimum efficiency levels. This means that if your solar panels are dirty and not cleaned regularly your expected income may be less. 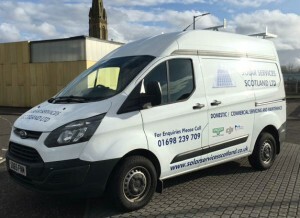 With over 15 years combined commercial experience in the solar industry, Solar Services Scotland have the knowledge, experience and expertise to fulfil any job no matter the size or scale of your operation. For a free no obligation quote or to ask any questions please email us on info@solarservicesscotland.co.uk. Or call us on 01698 239 709 to speak to one of the team.